You save £200.00 that's 40% off! Super Bright Security Floodlight with Black Polymer (Non-corrosive) Casing. 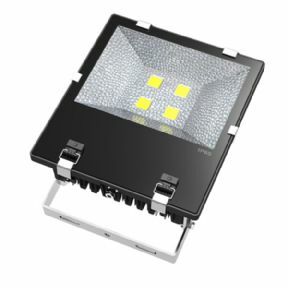 One of the brightest flood lights currently available in its class, this is a premium product suited for both commercial and domestic applications. Most floodlights are encased in aluminium which in most cases is more than adequate however this superior product is encased in a super tough ASA polymer casing that provides extra protection from the elements making it suitable for outside use all year round, but particularly suitable for areas less protected and extreme weather conditions including coastal areas, open spaces, car parks, fields etc. This led flood light only uses 200 watts of power which means that the floodlight will be much more economical than an equivalent halogen or halide light producing more lumens per watt. 200 Watts may not sound much, but this light is capable to illuminate a large area and will be suitable for most people basic needs equivalent to a traditional 2000 watt floodlight. The bulb operates at 240 volts so no transformer is required. Light output of this led flood light is huge 20,000 lumens curtosy of the superior BRIDGELUX chips. Many competitors do not offer products anything close to these light levels and similar products only mange to produce 13000 lummens at this wattage. If you need to illuminate your, driveway, garage, backgarden, business premises or carpark this product will do it without any problems. The beam angle of this led flood light is 120 degrees, which is considered a wide beam angle for this type of lamp, so it will light not only directly in front of the lamp, but also spread on the sides. The lamp itself is made with a black polymer casing and sealed with premium rubber to make it waterproof to IP65 to withstand harsh outdoor weather conditions all year round. Please note this product is not suitable for underwater usage. What is ASA? Acrylonitrile Styrene Acrylate is produced by introducing a grafted acrylic ester elastomer during the copolymerization process of acrylonitrile and styrene. Once the process is complete a Acrylonitrile styrene acrylate material has superior toughness and rigidity, enhanced chemical resistance and thermal stability which makes it a geat material for weather resistant products.